The design and creation of wearable art is a joyful process. Selling and marketing jewelry is an entirely different story. I have no business background. I am a Registered nurse by profession. TheFamiLeeJewels opened on Etsy in 2007 and has been growing slowly since. I am learning how to run it by trial and error. One of the biggest challenges along the way has been getting good quality photographs that represent the items accurately. Photographing small items like jewelry is an art and for me a work in progress. 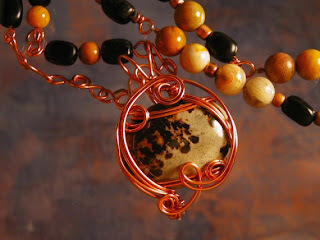 The first item I sold on etsy in 2007 was a copper wrapped piece of picture jasper. The necklace pictured above was my very first etsy sale. I was so so pleased with the picture at the time. It was clear and the color was true. When I look at it now I only see the too dark background. I have since started using an off white textured piece of photo paper to place the jewelry against. Along the way I experimented with props, but found most of them too distracting. They took the attention from what I was trying to have be the focal point of the picture. Props make a nice background but be careful that they are not too distracting. Today I still take a lot of pictures to get 5 that I consider good enough to sell jewelry online. I prefer to shoot them outdoors when the weather permits. I have found the truest color and detail appear outdoors on a sunny day but in the shade. In the winter I use an inexpensive light tent and some cone lights from Home Depot with true color bulbs in them. It's not ideal but better than incandescent light. The camera is a simple point and shoot 12.1 Megapixel Canon Powershot. I haven't been able to convince myself that my skill level warrants anything more elaborate. There are a few lessons that I have learned along the way. 1. Never use flash. It washes out the color of the stones and causes distracting hot spots in the picture. 2. program the camera for macro. 3. use the cloudy day setting. 4. take the picture with the highest resolution your camera allows. 5. I am thankful everyday for digital camera technology. Developing film to represent these items would have bankrupted me long ago. Every so often I get a picture that I am really proud of. One of my favorite jewelry photographs. Everything was going well this day. There are many more examples in my Flickr Photostream. Love that last photo! Actually, I love the first photo, too - the background is dark, but not distracting. Great post, Bonnie. I can never get enough photography tips! I have a long way to go too. You gave some good tips and I enjoyed seeing your pictures "along the way." Thanks guys. I enjoyed sharing. I have learned a lot from others along the way and want to keep that Karma circulating.